The Octopus: Enemy To Some, Friend Of No One. One may feel that given the number of extremities, the octopus would have more than enough legs to stand on. This however is a misnomer. As you will soon learn, the octopus is nature's biggest joke. In the early days of the octopus, it served a purpose. Crawling along the bottom of the floor devouring little fish that would otherwise go undevoured, it carried it's own weight. But as time progressed, the octopus found itself made redundant. As it always seems to go in this world, something newer, hipper, and ultimately better in every way came along. While some have called them cousins, the octopus knew the squid only as enemy. Did you know that Octopuses have three hearts, yet die shortly after copulating? How weak of an animal is that? The average lifespan of an octopus is just 2-3 years. And those in the depths of the ocean can only be expected to live up to five years, provided they don't mate. Guess those extra limbs get a workout, huh? Octopuses are said to very intelligent creatures. Makes you grateful to know that without bones they can't use it to their advantage. Ha ha nature, way to screw with them. 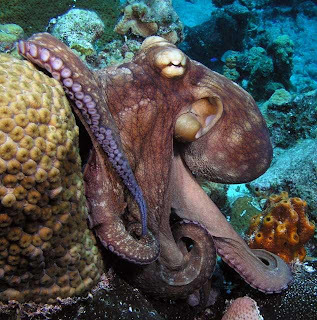 Octopuses can change color to match their surroundings. While some have stated that this is a defense mechanism that allows them to escape their predators and evade attack, the truth is that they are designed to do their jobs without being seen. Kind of like a housekeeper. Once valued for their ink, Octopuses have since become irrelevant in the world of calligraphy. Some octopuses if fleeing a predator can eject limbs from their body as a decoy. Which I have to admit might work purely on the basis that it is immensely creepy. Did you know that once you go squid you never go back? The octopus is indeed a gag bag full of mistakes, cowardice and yes, ink. Congratulations animal kingdom, you've been punk'd. Excellent work. A totally accurate tretis for the simple minds to digest. No more of this "Oh they are so cute" balloon juice. I hope you don't mind that I have to reprint this on my site. I've never felt so sorry for an underwater creature before. LOL, I love this line: Once valued for their ink, Octopuses have since become irrelevant in the world of calligraphy.